Tis the Season - the time of year when idyllic images go through our minds and we get wrapped up in the hustle and bustle of gifts and gatherings. As much as we would like to get lost in the holidays, work continues and we still need to get things done. So when you think about hauling home the evergreen tree, save room in the back of the truck to bring your Dustless Blasting machine Home for the Holidays and see why it's the ultimate way to work. Before we can talk about the why, lets talk about the what. Our Dustless Blasting machines are available in several different sizes. Machines are stand alone, compressor ready or available as a mobile business. All of the machines are identical in operation but vary in blast time and tank size. So whether you are a hobbyist with small restoration challenges or have large industrial maintenance needs, any of our machines can be run wet or dry and with variety of abrasives to meet your objectives. Now that you know what Dustless Blasting machines are, lets talk about why they are different. Media blasting machines have been around for a while, we have been in this business for 75 years! What makes us different is our ability to create innovative and reliable equipment that makes your job easier. Over time surface preparation has undergone many challenges of its own. Paints, gel coats and powder coatings have all become stronger, making it more difficult to achieve desired surface finishes with the use of chemicals, peelers, sanders and even some abrasives. If finishes are more difficult to remove, that means it will take more time to prepare a surface. The Dustless Blasting process allows you to be faster and more efficient with the entire paint removal process. It will take a fraction of the time over hand sanding and scraping and a fraction of the abrasive compared to dry blasting. As trends continue to change, Dustless Blasting strives to use state of the art equipment and processes to make our machines simple to use yet durable and reliable allowing you to make your job more manageable. As you consider your upcoming projects and your plans for the new year ahead, remember that the efficiency of Dustless Blasting can simplify your cleaning challenges and put you ahead of schedule. 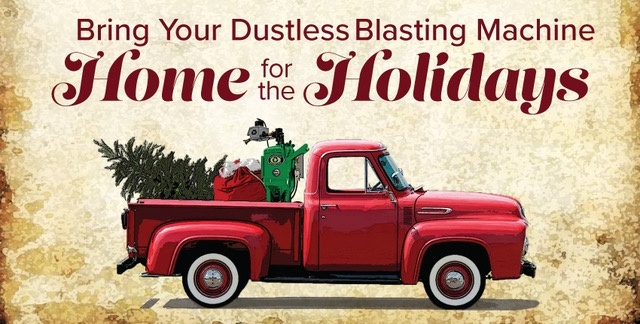 So pack up your truck and Bring Your Dustless Blasting Machine Home for the Holidays.